It looks like the rumours were true. But is it enough to make you upgrade? After the recent deluge of Samsung Galaxy S10 leaks, there's not much about the forthcoming flagship phone that we don't know ahead of the Galaxy Unpacked announcement next month. But while we might have a good grasp of the measurements, components, and raw numbers, we haven't really seen the Galaxy S10 range in the flesh. Until now. 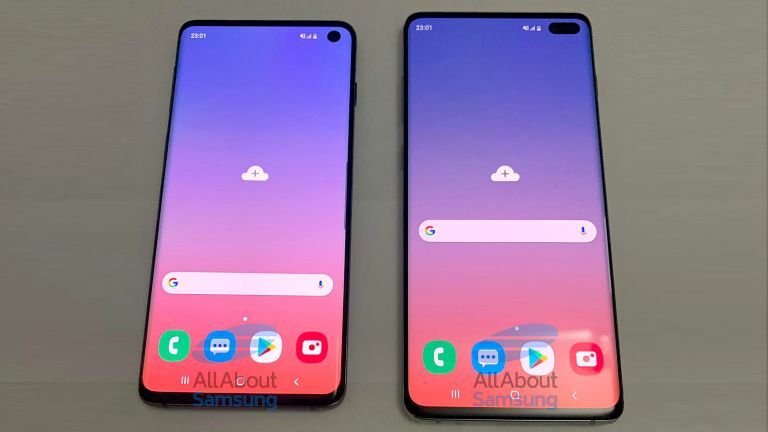 Earlier this week, a blurry paparazzi shot of the Galaxy S10 Plus that seemingly confirmed the long-rumoured dual front-facing selfie cameras embedded in the new Infinity-O all-screen design. However, a series of photographs purporting to show the Galaxy S10 and Galaxy S10 Plus have been uploaded to technology blog All About Samsung, which reveals both handsets from almost every angle. The leaked images appear to confirm a slew of rumoured changes coming to the Galaxy S9 and Galaxy S9 Plus successors, including the Infinity-O all-screen design, which buries the front-facing camera in a small hole-punch opening in the top right-hand corner of the OLED display, and the triple-camera on the back of the handset. According to an earlier leak by prolific XDA Developers contributor Max Weinbach, the Galaxy S10 and Galaxy S10 Plus will couple an ultra-wide 16MP f/1.9 lens with a 123-degree field of view but no optical image stabilisation (OIS) with a 12MP lens with the same variable aperture mechanism introduced with the Galaxy S9 last year. As before, this camera will automatically switch between f/1.5 and f/2.4 based on the amount of available light to improve image quality in challenging conditions. The third camera will purportedly be a 13MP f/2.4 telephoto lens with OIS and a 45-degree field of view. This will help with the depth-sensing abilities and allow for more accurate bokeh-style blur in the background of Live Focus photographs. New software features, including Bright Night and Portrait Lighting, will apparently be added to the Samsung camera app, too. According to the latest images from All About Samsung, the 3.5mm audio port will remain intact on the Galaxy S10 and Galaxy S10 Plus. That's likely to appeal to a lot of customers. Samsung is one of the few remaining manufacturers standing by the once-universal audio connector. Fellow stalwart OnePlus decided to ditch the 3.5mm headphone port in order to increase the size of the battery cell in its OnePlus 6T. Neither Galaxy S10 handset has the rear-mounted fingerprint seen on earlier flagships from Samsung, which suggests rumours of an in-display solution were correct. Samsung is widely-tipped to be working with Qualcomm to develop an ultrasonic scanner capable of reading fingerprints placed on the glass display. Unlike traditional optical sensors, the ultrasonic variant does not compare smartphone owners' prints against a two-dimensional pattern previously stored. Instead, the new technology – dubbed 3D Sonic Sensor – creates a three-dimensional mould of the fingertip by bouncing soundwaves off the skin through the display. According to Qualcomm, the sensor can capture a breathtaking amount of detail – down to the individual ridges and pores. This makes it far more accurate than optical sensors that compare the pattern of the fingerprint. Although these undoubtedly look like previous Galaxy S smartphones, there's a serious amount of new technology squeezed into these handsets. Of course, that means we can expect a price bump with the latest flagship models. According to a reliable source speaking to Gizmodo, the entry-level Samsung Galaxy S10, which has a 6.2-inch Infinity-O AMOLED screen with 128GB of storage will cost £799. This is reported to rise to £999 for the 512GB model. Meanwhile, the Samsung Galaxy S10 Plus, which reportedly has a larger 6.44-inch Infinity-O AMOLED display with dual front-facing cameras and 128GB of storage, will set you back £899. The maxed-out 512GB model will cost £1,099. As always, none of this is definitive until Samsung announces it on-stage during its upcoming Galaxy Unpacked event on February 20. However, this close to the event, it seems like the rumours are really firming up.